Aperture Jam: An update here and an update there. An update here and an update there. A few months ago I posted some drawings and a digital clean up of my 'Kiwi Kong' character. 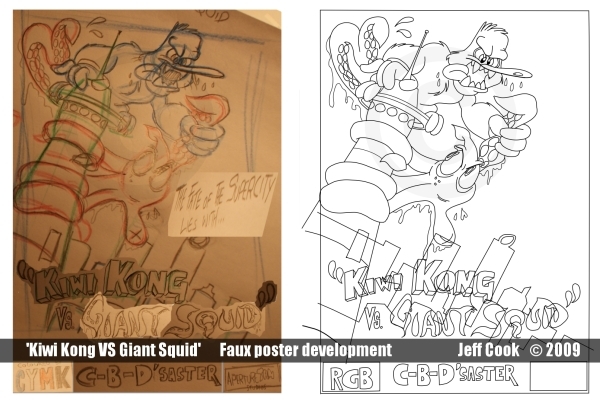 Here is my paper layout and digital line art for a poster I plan to get printed sometime. So I drew this up with coloured pencils, darkened the lines and then traced over it in the computer. I use Gimp as my photo shop and Pencil as my vector based tracing software. When I get around to colouring this it will either be done in Inkscape or Gimp. More on Software here. I 'm working on a few projects at the moment, Two of which are short animations for friends who are making their own short films. Also I need to colour this poster and another image which close friend's of mine have been waiting for. As for my short film, further work is on hiatus until the end of September, once I get some of these other pieces of work completed.